After composing a musical tribute in memory of Lucienne Gourdon Biggs, I came back into contact with John Biggs, with whom I had performed when a student at Los Angeles City College so long ago. In writing back and forth, he sent me a charming short video of his wife and him singing an a cappella "thank you" duet, which led to this little work in the form of a prelude and fugue. Biggs' work as a composer and performer over the years is known to many. His Consort Press details his work over many decades. Of Biggs and his "independent route" through life, one reads: "Unlike many working composers in America, Biggs has been a composer without a post, without an academic support system. During a a five-year stint, Biggs worked as a composer-in-residence at colleges in Kansas, during which time he wrote such well-known pieces as 'Paul Revere's Ride' and 'Auction Cries.' Since then, Biggs has chosen the rough route of the independent composer. 'Stravinsky was against composers being on a faculty and making that their main role. He felt that you have to be out there, finding the needs of the community and writing for them'." In "PROFILE : Piece by Piece : Composer John Biggs is trying to guide symphonic music out of the ruts of the past." by Joseph Woodard, Los Angeles Times, 14 May 1992. On a pleasant summer's day in 2018, Manuel Rosales and I paid a call on John where he lives in Ojai, California, enjoying reminiscences aplenty. Among other memories, John spoke of his parents, and specifically of his mother that, when she had delivered her first child so long ago, the physician said she was too small to have more. Her answer and that of this beneficent life was to deliver ten more into the world. For his mother who I often saw after concerts so long ago, and after reading her biography of her husband, I composed a little tribute for organ, entitled Grâce et simplicité . Of his father, John repeated a favorite joke which he told, defining a fugue as that in which voices enter, one after another, all the while the audience leaves, one after another. 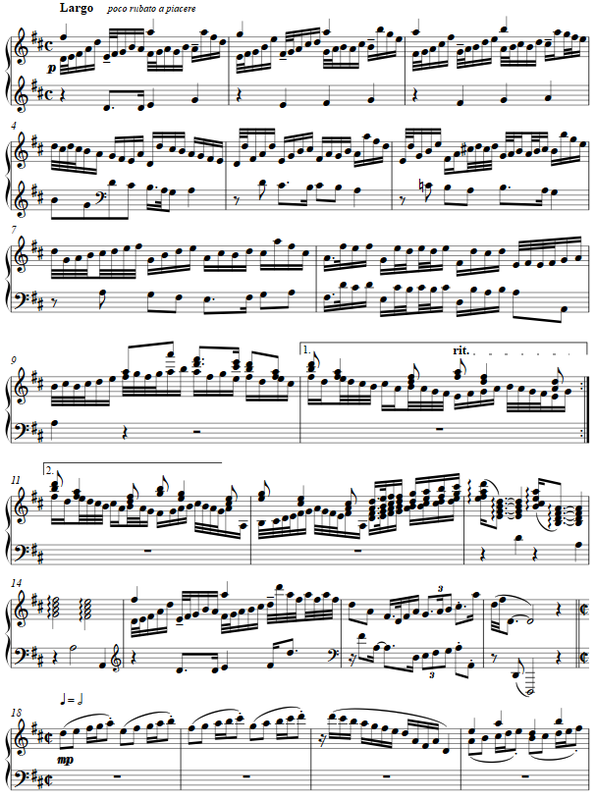 The theme by Biggs is decorated with arpeggios and a second voice , which then becomes the answering portion of the round, to say "thank you very much." The fugue subject and episode continue this in a light hearted manner.